A few days after being sworn in as the new Housing and Urban Development secretary, Ben Carson described slaves as “immigrants” Monday in an address to department employees. “That’s what America is about, a land of dreams and opportunity,” Carson said. “There were other immigrants who came here in the bottom of slave ships, worked even longer, even harder for less. But they too had a dream that one day their sons, daughters, grandsons, granddaughters, great-grandsons, great-granddaughters, might pursue prosperity and happiness in this land,” he added. The comparison prompted strong pushback on Twitter, including from actor Samuel L. Jackson (WARNING: strong language in his tweet), who all pointed out that slaves weren’t willing participants in their journey to Ellis Island. HUD spox says no one in the room believed Secretary Ben Carson "was confusing voluntary immigration with involuntary servitude. Please." 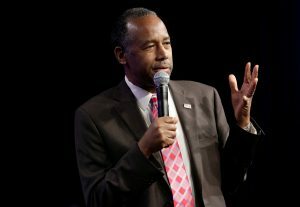 A staffer on Carson’s team told the Washington Post that the department has many African-American employees, adding that people stood up and applauded at the end of the secretary’s remarks. “Many went to take pictures of him,” the staffer said, speaking on background. Another unnamed staffer told the Post that Carson’s point was that people didn’t just arrive at Ellis Island. “If anything, I thought someone may have taken issue with the fact that he was pointing out it was rougher for black people,” the staffer said. As a quick reminder, the retired neurosurgeon has a history of controversial comments.